John has enlisted himself in the army, he should be in college, but decided not to go. He enlisted himself fresh out of high school, because he had no idea what else to do with his life. While he is on a break from the army, he is swimming. Savannah - who he does not know yet is walking on the beach with some friends. Savannah happens to drop her purse in the water. John races in the water to get it. He saves her bag!!! She says thank-you, they talk...and boom! Now they are hanging out together, and having so much fun. Basically dating. When John realizes he has to go back to the army in a week, he is sad. He does not want to leave Savannah, he tells Savannah and she is sad as well. They decide to write to each other. When he leaves for the army Savannah gives him the first letter. John writes back, and she writes back, and so on, and so forth. John stays safe in the army. He is fine, and decides when his enlistment is over he is going to Savannah, and not enlisting again, until September 11th, 2001 comes. He decides he has to choose country over love. Savannah is upset, but completely understands. They keep writing to each other. When he is done he goes to a party with Savannah, at her parent's house. When the party is over, he tells her that he has enlisted again, she is very mad. She thought he was done for good now. But he simultaneously decided to re-enrol. Savannah is not too happy. They still write and he still enlists. When one day a letter comes. It changes John completely, he is angry, sad, and confused. John burns all the other letters out of anger. he keeps enlisting because now he doesn't know what to do with his life again. When one day the General tells John he needs to go home because something is happening with one of his family members. His dad, Mr. Tyree. He goes to visit Savannah and tells her the news, the night is going great just like old times, Savannah shows John her ranch, and how she accomplished her dream, but it also did not turn out that well, the night is still going fantastic until they get in an argument and John leaves. To find out more, well you have to read the book! I have a friend whose dad is in the army, but I have never really felt what it is like to have someone that important in my life go to war. I can only imagine what it feels like though. I have felt what it feels like for someone so important in my life to go away, though. And I know what that feels like, so I can only imagine what Savannah feels. I would recommend this book to anyone who likes loves stories. But not to anyone who dislikes sad books, because it is very sad. I was upset, but it was an amazing book. I think anyone would enjoy it. The book is probably for people around the age, thirteen and fourteen, through ninety-nine. I read it when I was eleven, and loved it. But honestly , I like books for older kids... lie teenagers, I am am not sure if another eleven year old would like it as much as I did. But it was amazing, and I think anyone would enjoy it. 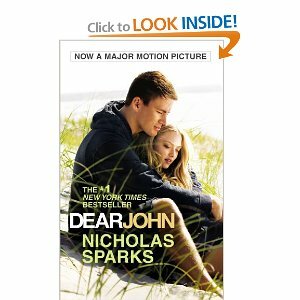 My overall opinion of "Dear John" is that it was an amazing book. I absolutely loved it. It was happy, and sad, and was a beautiful love story about two people falling in love but there is a complication. It completely fulfilled my standards! I loved it, and would read it again any day.